RALPH is the collective group of all-stars used by Bongo Beat Records supremo Ralph Alfonso for his garage rock/jazz solo projects. This 3-track CD EP veers more into pop and garage rock and features guest appearances by Dave Rave (Teenage Head), The Plastic Heroes, and Ari Shine. Lead track is "Billy Fury, Billy Fury" a Joe Meek style tribute to the UK's greatest rocker that has been championed by UK DJ/rock historian Spencer Leigh (he wrote the Fury book & also mentions this song in his definitive book on The Cavern Club) on BBC Merseyside where Ralph has also performed this live. "Yesterday And Today" is a tribute to the DJs of 60s Pirate Radio who became prisoners of rock'n'roll so that the UK airwaves could be free. This track was recorded and produced at Paramount Recorders, Vancouver, by Buck Cherry (The Modernettes) and Gord Nichols (The Pointed Sticks). 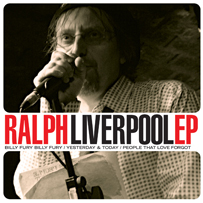 Cover photo of Ralph at The Cavern by Stephen Bailey.